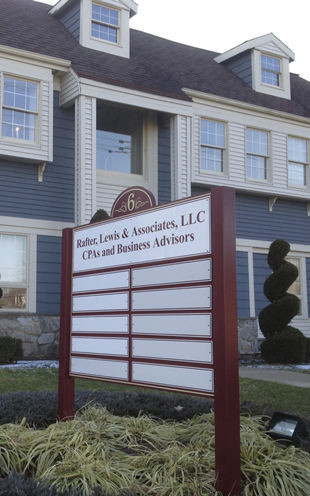 Welcome and thank you for visiting the website of Rafter, Lewis & Associates, LLC, located in Haddon Heights, New Jersey. We appreciate the opportunity to provide information about our firm. We are a CPA firm that represents a wide range of commercial enterprises, including, but not limited to, manufacturing, publishing, engineering, construction contractors, wholesale distributors, health care practices, printers, attorneys, architects, retail establishments, restaurants and other service companies. The firm's clients also include individuals and families as well as nonprofit organizations. Our firm is dedicated to meeting the professional needs of Small Business Enterprises and Individuals. Our services go beyond the accounting firm's traditional role of financial statement and tax return preparation. We believe an accountant must be a Trusted Advisor, able to help our clients anticipate and respond to changes in the economy, industry, financial reporting rules, as well as the tax laws. We act as a "sounding board" to our clients, helping to evaluate major strategic, financial and tax planning decisions. We realize that for Small Business Enterprises, the financial and tax strategies implemented for their business will also affect them personally. This is why our capability to provide insight and advice on all aspects of our client's financial situation is so important. It means that they will have the professionals with the most knowledge about their complete financial picture providing these critical recommendations.